Brain injuries are considered medical emergencies and extremely serious, therefore need to be treated immediately. There are two general types of brain injuries - those due to traumatic injury and those due to medical malpractice. Types of brain injuries that arise due to medical malpractice come from various sources, including birth injuries, complications of anesthesia, surgical errors, medication errors, inadequate perfusion during coronary artery bypass surgery, compression of trachea, and failure to monitor/treat hypotension. Our law firm handles these cases. If you or a loved one has been harmed or killed from a brain injury caused by medical malpractice, call us today at 800-553-8082 or get a free online consultation. Learn whether you can sue and receive money damages in a lawsuit or settlement for the harm that has been done. The brain needs a constant flow of oxygen. Because the lungs transfer oxygen from inhaled air into the bloodstream, the loss or impairment of ventilation causes inadequate oxygen in the patient's bloodstream. Because the blood delivers oxygen to the brain, the insufficient oxygen levels in the bloodstream cause inadequate oxygen levels in his brain. A lack of oxygen supply to the brain causes serious impairments in cognitive, physical, and psychological functions. Within just five minutes of the oxygen supply being cut off, brain cells begin to die. The longer the brain goes without oxygen, the more serious the consequences are that can occur such as coma, seizures, and brain death. This is why brain injuries need to be treated as quickly as possible. The longer a person goes with oxygen deprivation to their brain, the higher their chances of brain death and severe brain injury are. Medical malpractice lawsuits from brain injuries are so frequent because there is little margin for error. The brain is extremely to decreased oxygen levels. A total lack of oxygen to the brain can cause injury in as little as three minutes. As the oxygen level falls in the blood, brain cells begin to misfire. These cell misfire because they are starved for a vital substrate for running all of the cellular functions. As the deprivation continues, begin to die. Soon, the loss of brain function becomes irreversible. When brain cells continue to die, the blood vessels supplying blood to those cells begin to leak out fluid that causes swelling. This starts a vicious cycle. The swelling causes further brain cell death. Eventually, as cell death occurs in the brain's respiratory center, the patient's respirations begin to slow and finally stop. Many brain injuries from medical malpractice occur while the patient is sedated. So there are no noticeable symptoms other than the patient's vital signs. If treated immediately, a brain injury has less chance of causing severe, permanent injury. However, the trick is to notice, diagnose, and treat the problem causing the oxygen deprivation as quickly as possible. The longer the patient is left with a brain that is not receiving oxygen, the higher the chances of irreversible damage. Below are some examples of sample verdicts and settlements in recent brain injury malpractice cases. Keep in mind that each case is different and the exact outcomes of each case vary due to specific facts and circumstances. 2013, Prince George's County, Maryland: $9,500,000 Verdict: A two-week-old female is seen in the ER, and the nurse fails to report her abnormal blood culture results to the physician on duty or send them to her primary care provider. The infant then develops left hemiplegic cerebral palsy, a brain injury associated with mental retardation with speech deficits, and a seizure disorder as a result of the delay in diagnosing her sepsis and meningitis. A jury agrees and awards $9,500,000. 2013, Anne Arundel County: $8,344,514 Verdict: A 42-year old female is undergoing endoscopy and colonoscopy. She goes into respiratory and cardiorespiratory arrest due to her colon rupturing, and she develops cerebral hypoxic-ischemic and a severe anoxic brain injury, resulting in her death two weeks later. The jury finds the doctor in breach of the standard of care, and the proximate cause of her death, resulting in a verdict of $8,344,514. 2012, Baltimore City: $21,000,000 Verdict: A woman is giving birth to her daughter at Harbor Hospital when the doctor fails to exercise a reasonable degree of care and skill during the birth. As a result, the baby suffers spastic cerebral palsy, reduced cognitive and mental capabilities, hypoxia, and other conditions. The plaintiff argues that the doctor failed to recognize and treat the child and mother's serious conditions, which led to the severity of the child's status. The defendant attempts to argue that they applied the applicable standard of care. But the jury agrees with the plaintiff, awarding $21,000,000. 2016, Oregon: $3,720,000 Verdict: A 38-year old female teacher collapses at home one day while walking down the stairs. She is transported to the hospital with a suspected stroke. At the ER, more tests and a CT are conducted. But the CT misses a clot in the middle cerebral artery. The doctor admits her to the hospital with a likely psychiatric stress response when he learns that the patient just found out that her grandmother's cancer may be terminal. No neurologist is called, even though the plaintiff is unable to walk or talk clearly. The clot sits in her brain for over eight hours and results in a permanent brain injury. 2016, California: $20,000,000 Settlement: A minor child is under the care of nurses when they fail to adequately monitor her feeding tube, which results in brain damage. The matter resolves with a confidential settlement prior to trial. 2016, Washington: $2,350,000 Settlement: A 42-year old male is employed as a mechanic, and is prescribed Coumadin after being diagnosed with Deep Vein Thrombosis. He misses his follow-up appointments after starting the medication. But the doctor still refills the prescriptions. He finally comes in for monitoring, and his INR is measured at 4.9 when the goal is between 2 and 3. This means he is at increased risk of bleeding. The doctor reduces dosing. Four days later, he suffers a massive brain bleed resulting in paralysis. He files suit, claiming his Coumadin should have been discontinued. The case settles for $2,350,000. 2016, Alabama: $10,000,000 Verdict: A 3-month old infant is brought to the hospital with a fever and other symptoms that could be indicative of a bacterial infection. The physicians observe him but do not perform tests to rule out an infection. He is discharged without antibiotics. The next day he is brought back as his symptoms are worsening. This time, he is admitted, however once again, no testing is done. Two days later, he is discharged without antibiotics. Once again, the next day, he goes to his family practitioner who immediately performs a lumbar puncture, confirming bacterial meningitis. He suffers permanent brain injuries, hearing loss, visual impairments, hydrocephalus, and a seizure disorder due to the hospital staff's negligence in diagnosing and treating his infection. After a jury trial that lasted five weeks, the plaintiff was awarded $10,000,000. 2016, Massachusetts: $6,250,000 Settlement: A female is pregnant with her second child, and presents to the hospital about a month before her due date with a membrane rupture with clear fluid. She is placed on fetal monitoring and is told after twelve hours that she is doing well even though she claims that the monitoring showed an increase in the baby's heart rate. The doctors finally become worrisome about the fetal monitoring about an hour later but do not take any steps. The baby is delivered, and has immediate respiratory issues and requiring immediate intubation. He sustains a global brain injury, leaving him unable to speak or walk without assistance. Plaintiffs claim that the doctors were negligent when they did not perform resuscitative measures and immediately deliver the infant when distress signs began showing. The parties settled for $6,250,000 in a confidential settlement prior to jury selection. 2015, Kentucky: $18,270,052 Verdict: Plaintiff mom arrives at the hospital to have her labor induced, after having a normal pregnancy without complications. She is administered Pitocin, and the doctor instructs that she should not exceed four contractions within an hour. The doctor leaves, and the nursing staff allows the contractions to exceed the maximum of four for six hours, which hinders her ability to push. As a result, the baby is deprived of oxygen and stuck in the birth canal for a period of time. The infant suffers a hypoxic brain injury as a result, as well as cerebral palsy and spastic quadriplegia. A suit is brought against the doctors, alleging negligence in failing to deliver the infant timely and failing to comply with the standing orders regarding the labor. A jury agrees, awarding $18,270,052. 2015, Washington: $900,000 Settlement: A 65-year old male goes to the ER with chest pain and fever. His blood is drawn, it is positive for strep growth, and he is given Levaquin. The report is sent to his primary care provider, who does not follow up with him. The man returns to the ER two weeks later due to back pain without injury and is given Prednisone. Three days later, he goes back to his primary care provider as his back pain is increasing, and is given Vicodin. He goes back again several days later as it is still increasing. A few weeks later, he goes to the ER with weakness, fatigue, dizziness, and blurred vision along with his back pain. He is diagnosed with polymyalgia rheumatic and goes back to his primary care provider two more times within a few days for his back pain. His primary care provider consults with another doctor, who says that maybe his artificial heart valve is infected. 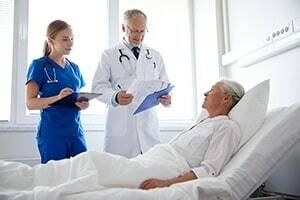 His doctor who received the strep blood cultures admits him to the ER with a presumptive diagnosis of bacterial endocarditis, and he suffers a stroke a few weeks later. The stroke is a result of an embolic event due to the valve infection breaking off. As a result, this man suffers brain damage, which leaves him with many problems including difficulties swallowing, memory loss, depression, a limp, vision problems, and many others. The case settles for $900,000 prior to trial. 2015, Oregon: $12,195,500 Verdict: A 51-year old male is having an aortic valve replacement surgery at the hospital. The surgeon orders 150 mg of Amiodarone, which is the standard dose. However, the anesthesiologist administers 2,700 mg. This results in an anoxic brain injury due to the overdose, leaving the man no longer able to work or walk on his own, requiring 24/7 care. A jury awards him $12,195,500. 2015, Massachusetts:$5,750,000 Settlement: A 35-year old male has a bone marrow transplant completed successfully, and is in the process of being discharged when his central venous catheter is being removed. The resident doctor deviates from the standard of care by not having the man lay supine to do the removal. The plaintiff becomes unresponsive and goes into cardiac arrest, resulting in a bilateral anoxic brain injury. He files a claim against the hospital, alleging that the standard of care for removal the catheter was for the patient to lay supine to reduce the opportunity for an air embolus to happen. He suffers permanent physical impairment, cognitive deficits, and is unable to work. The parties settle for $5,750,000 in a "confidential" settlement agreement. 2015, Illinois: $9,400,000 Verdict: A 46-year old female has gastric bypass surgery performed. She was given two blood thinners prior to surgery, one of which stays in the system for 17-21 hours. Her brain is deprived of oxygen for more than ten minutes, which causes permanent brain damage. She brings a suit, claiming that the doctors were negligent in failing to understand the effects of her use of one of the prescriptions, as they didn't wait until she was not at high risk for bleeding prior to proceeding. The doctors try to argue that she wasn't injured to the full extent she is claiming, and that post-surgical bleeding is common after bariatric surgery. The parties settle for $9,400,000 before trial. 2015, New York:$850,000 Settlement: A minor child undergoes an endoscopic ventriculostomy procedure. During this, the endoscopic arm fails, the doctor loses control, and the arm perforates the cerebral floor of the child's brain. This causes hemorrhaging and brain damage. The parents of the child file suit, alleging that the hospital failed to use reasonable care and departed from accepted practices when negligently performing the procedure. The parties settle for $850,000. 2014, Florida: $620,000 Verdict: A female patient receives a prescription for Methotrexate, six pills to be taken every Wednesday. However, the pharmacy labels the bottle as "to be taken six pills per day." The woman listens to the instructions on the label for five days, as the supply was exhausted then. She returns to her doctor, who discovers the pharmaceutical error, and admits the patient to the hospital for detoxification. The overdose results in neurological damage to the brain as well as memory loss. A jury awards her $620,000. If you or someone you love has been suffered a brain injury as the result of a medical mistake, we can help you. Miller & Zois has a history of success in getting large verdicts and settlements in brain injury cases for our clients. We are here to help you get the money you are entitled to get for the needless pain you have suffered. Call us today at 800-553-8082 or get a free, no-obligation online case review.